As we were warmly greeted, on a slightly wet and chilly October day (and I was offered free entry as a garden designer – woohoo! ), the lady at Chanticleer’s reception kindly proceeded to describe to us the key features of the garden. She pointed us around a map of the 35 acres, making special mention of the plantless boxes in the first courtyard. I smiled encouragingly, showing her that, as a garden designer, I quite understood that at certain times of the year we need to change our pot plants over and it was quite OK that we’d just happened to pick the changeover time. As she went on to the next garden ‘room’, she mentioned that we should look out for the plantless boxes there, too. Clearly these planters were pretty special, plants or no plants. She told me that as a garden designer, she was sure I’d particularly appreciate them. We set off on our way and, in my usual way, I was soon lost in the garden, all-consumed by all things green. I’d forgotten all about the plantless boxes, until my friend, Chris, piped up with, “hey, look, there’s a list of plants in this box”. A plant list box. One in each and every garden room! There are so many surprising plants at Chanticleer; I had to keep reminding myself I wasn’t in the subtropics! I was clearly destined to visit Chanticleer. Michael McCoy had told me, a year or so ago, that it was almost a life-changing garden for him. Then, earlier this year, I was kindly given ‘The Art of Gardening’, by Bill Thomas, Chanticleer’s Head Gardener, as a thank you for a speech I gave in Sydney. So, when our gorgeous friends, Caroline and Chris, said they would be travelling in the vicinity of Chanticleer whilst Paul and I were just down the road in New York…it was clearly meant to be. Chanticleer has been described as a ‘gardener’s garden’. 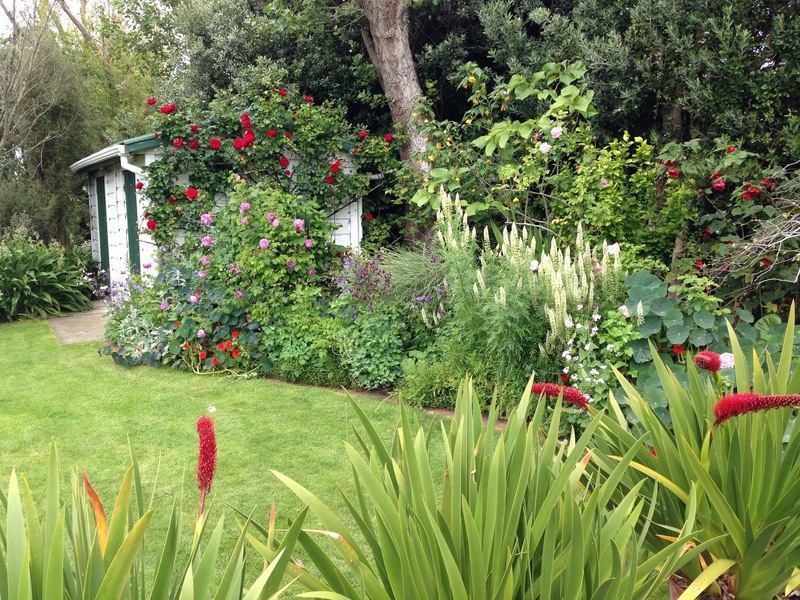 A garden run by gardeners, designed by gardeners and existing for gardeners. It’s also been called “the most romantic, imaginative and exciting public garden in America”. And it’s not hard to see why. It all started back in 1912, when the Rosengarten family purchased the block, full of towering American chestnut trees, and built their new home. Later, two new houses were built on the property for the Rosengarten children, one of whom, the late Adolph Rosengarten, followed his mother’s love of gardening and set the garden up for its future. So full of hope, optimism, pro-activity and energy and the belief that you really can make a difference if you just take responsibility and get out there and do it. Bill Thomas has been Chanticleer’s Head Gardener for the past 13 years and is every bit as inspiring as Adolph. He describes the difficulty some have with understanding the purpose of the garden. It’s not a home, it doesn’t get rented out, there are no weddings…it’s simply “a garden; a place of beauty, pleasure, escape”. He goes on to say that ultimately the aim is for guests “to leave in a better mood than when they arrived”. You can’t argue with that. It’s clear that Bill has also been just as fundamental to the garden’s success as Adolph. He leads a team of highly talented and motivated horticulturists–many of whom have been with him since the start–giving them just the right level of autonomy, encouragement and guidance. It’s funny to say that when I haven’t actually met the man, but it’s so blindingly obvious, both through visiting the garden and reading the book. He talks of how he started planting vegetables when his parents thought he needed something constructive to do with his time and after discovering vegetables were actually tasty and devouring both (!) horticultural books in his local library, he now finds himself in a job which is the culmination of his dreams. I don’t know how many leadership courses I have been on in my life, but I’ve got a lot to learn from Bill. His enthusiasm is clearly contagious and he instills a culture of innovation, allowing ‘mistakes’ along the way to finding the breakthrough successes. You can feel the pride in the garden, even on a wet Sunday morning with not a single gardener in sight. I’m already scheming about how I can use some of these leadership techniques with my dear husband in our future garden, to get him excited about taking part. And in particular, to say ‘let’s think about that’, as Bill does to his team’s less compelling ideas, rather than my usual response of, ‘no Paul, that would look awful’. I’ve so very much to learn! Bill actually describes the garden as a research laboratory, where new plants, designs and techniques are trialled, all within the public eye. He isn’t worried that people see both successes and failures, although mentioned that they do try to rush the ‘losers’ to the compost pile. “easily matches my experience of the best of the UK gardens, though it’s different, very American in a way I haven’t been able to define”. Fascinated as I am by the differences in culture and gardens between the UK and Australia, I thought I’d research how America fits into this, too. It’s a very dangerous topic, full of generalisations and the potential to unwittingly offend, but the way we learn to make sense of the world is through generalisations and I’m a lifelong ‘learner’, so I’ll take the risk. We just need to recognise that a generalisation is just that: there are always many exceptions. I’ve just finished reading an excellent book, ‘The Authentic Garden’ by a very talented American lady called Claire Sawyers and I also learnt much from blogger, Jason Kay, and his commenters, on his article, ‘Is there such a thing as an “American” garden?‘. One (American) lady comments that the ethnic diversity of America contributes to a vast range of styles and another suggested that as time goes on, more trends can be traced as a unique American garden tradition starts to develop. “I think American gardens exhibit more freedom to experiment and embrace individual ideas“. Indeed, coming back to Chanticleer, Bill Thomas says he hopes the garden inspires people to garden ‘more freely’. Liberty is a fundamental concept in the United States Constitution and the US has a long history of outstanding innovation. I think it is this characteristic of free-thinking, innovation and not being afraid to try something new, which makes Chanticleer so special. It looks to surprise, create high impact, be novel and almost theatrical, whereas perhaps typical English gardens are more restrained, more subtle. I remember seeing an Australian garden at the Melbourne International Flower and Garden Show, with predominantly native plants but then one bright, large-leafed Hydrangea thrown in and I laughed when I read that Chanticleer aimed to have plants with a relaxed feeling but “just to show we aren’t too serious…we throw in some artificial-looking plants like hydrangeas”. A visit to the Liberty Bell in Philadelphia, half an hour from Chanticleer, reminded me of being a Brit in Kuala Lumpur on Merdeka Day, when Malaysians celebrate their independence from the UK! There is also perhaps a little more practicality in American gardens–as I feel there is in Australia–of selecting a material based on its fit for purpose, rather than one that is perhaps steeped in history but not technically so good, as we might over here. The recycled tyre walkways at Chanticleer reminded me of Colorbond fences in Australia. Maybe where the pioneers to the new world value innovation, the English value tradition. Not that we don’t ever innovate, but it’s perhaps more the talented few that do and the rest safely follow lead. It’s all a bit deep for gardens, really, but I do find it fascinating to see the differences and similarities. I think I’m probably quite English at heart but the interesting twist is that I always, always–without fail–prefer gardens with a sense of place. Gardens in America are much better when they look American, just as gardens in Australia are much better, to me at least, when they feel Australian. But I think there are some underlying principles–that I’m starting to pin down through my dissertation–which can carry across and be used anywhere in the world. Principles that can be applied to local natural and cultural history to produce something quite distinctive and special. Whilst I continue to work on that, I’ll leave you with the lovely words of Bill Thomas, which I think probably trump any other advice we could possibly be given on garden design. What a wonderful garden – many thanks for the tour! Very interested in your comments about ‘American’,’Australian’, and ‘English’ gardens. I’ve only experience of the latter, but we English are traditionalists to the core. Makes me think of the raised British eyebrows when Christopher Lloyd dug up his rose garden and planted tropical plants in their place. Thanks very much! You are so right about Great Dixter…it’s the one garden in the UK that I can think of that bears some resemblance to Chanticleer. In fact one of the horticulturists at Chanticleer did have two years of training at Great Dixter, so there is some direct connection. Love your use of the phrase ‘raised British eyebrows’ by the way; it reminds me of the Stephen Fry Heathrow video (https://www.youtube.com/watch?v=K7cFXSDN_5k). It’s a goodie if you haven’t seen it! Perhaps Bill’s book is one for your Christmas list? It’s just so lovely the way it is written. Absolutely, you shouldn’t worry about what anyone else is doing. Take ideas you like, yes, but you should completely make it your style. I think that’s why my most satisfying projects are often the ones helping keen gardeners find their way, design-wise. It’s ever so exciting to have a blank canvas and an open-ended brief but actually the long term pleasure in my job comes from seeing a client who is deeply engaged with their garden and has made it entirely ‘theirs’. The true joy is their eyes is worth a hundred times more than observing any technically ‘right’ project. Thanks for the tour, a lovely garden. I haven’t seen many American gardens, but there is a flavour of the US about this one I think. I love the soft pink grasses, which I have seen in some US blogger gardens (Muhly grass I think)….It could convert me to grasses! My cousin has a lovely garden in Queensland, and mine in Canberra is very different, so I’m not sure about a typically Australia garden…but because we were both born and brought up in Africa we have managed to plant some of our favourites from Africa. So gardens are all about place and identity too I guess. Lots in the post to think about! I think my brain is still a little busy, too! I started writing and all sorts of things came out. I do like a garden that makes you think. You are spot on about the pink grass: it is Muhlenbergia capillaris. It makes quite an impact, doesn’t it? It’s interesting to hear about your cousin in Queensland. Whilst you clearly live in very different climates and will therefore have some very different plants, it’s lovely to hear that you have both added a bit of your African homeland to each. I think identity is a big word in gardens…it’s one of the things I’m studying at the moment. Enjoying the thought provoking posts. 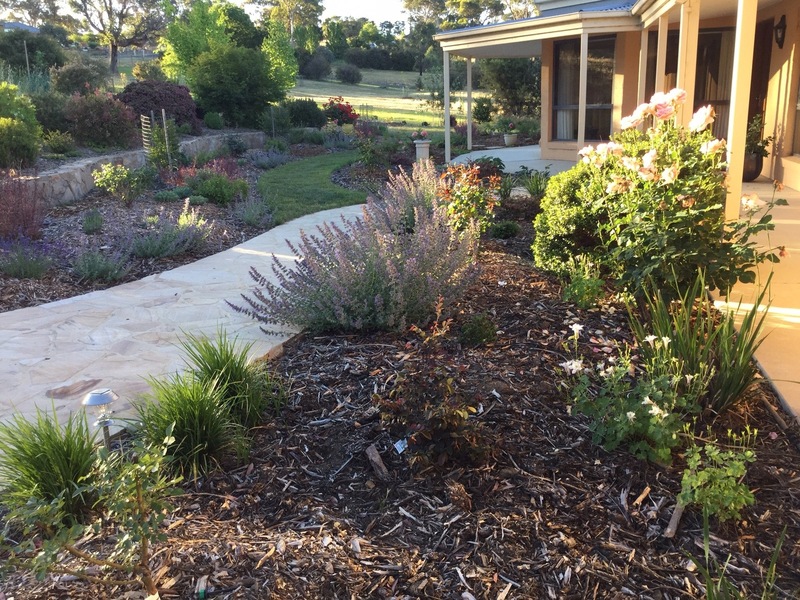 Oh, such an interesting and thought provoking article, Janna, I couldn’t agree more with Bill Thomas’ advice – it was something I felt very strongly about when it came to redesigning the front garden. Finding the courage to do what I envisaged, not what everyone else might like, was the hardest thing. Do you not wonder if/why English gardens and garden makers are sometimes a little reticent, self conscious, maybe even apologetic about their work which then shows in the finished product? I think most gardeners like to share the pleasure of their garden with others, so they want people to like it. I guess in doing something a little different we risk reducing the appeal to a narrower audience, but ultimately the owner’s (and hard worker’s!) pleasure should always come first. We also rely on people to try new things in order for all of us to progress so I’m very glad you did find that courage. I think it’s probably just our very polite English nature which leads us to be apologetic (I so noticed everyone’s inclination to apologise when I first moved back here e.g. when you accidentally stand on THEIR foot on the tube!) but all gardeners notice the weaknesses in their own garden that a visitor doesn’t; that’s definitely true worldwide! Like you, I’m a huge fan of Bill Thomas and Chanticleer. You couldn’t have picked a better garden to visit on your recent trip. It’s fun, innovative, stimulating, plant-packed, artistically and carefully-crafted, superbly maintained, and immensely satisfying. Thanks for the shout out on my idea of what distinguishes an American garden. Jason’s point about the book intro was spot on and he certainly inspired a remarkable conversation on the topic. I hope we get to hear more about your trip and impression of American gardens. I did have the dilemma of Longwood or Chanticleer but the ‘gardener’s garden’ swung it for me and I was very happy with my choice. Obviously, I ‘need’ to go back again to see Longwood one day though! It’s nice to hear that you, as an American, think Chanticleer was a great garden to see though; as you know, I love seeing gardens with a local flavour to them. One of the definitions of a great garden, I think, is that it still looks good on a cold, wet October day. It certainly passed that test with flying colours. Next up: Brooklyn Botanic Garden! I’ve followed the blog of Janna Schreier, a talented garden designer and perceptive observer, for many months now. Her gardening instincts and insights always provide a new idea to ponder. I hope you’ll enjoy this post about her recent visit to Chanticleer as much as I did. Thank you SO much for your very kind comments, Marian. You’ve made my day! Came over here from Marian’s blog. I too went to Chanticleer last June and oh what a day and place. And, now I want to go to Great Dixter. I heard Fergus Garrett last spring; maybe this coming May. I hope!! Nice to see you over here and thanks for your comment! I can imagine in June the garden was looking absolutely incredible. I loved the muted autumn colours that I saw but it would be great to see it looking bright and fresh, too. I do hope you get to Great Dixter next year. It’s such a special garden and Fergus is such a lovely, special man. I bumped into him in the Sunk Garden there one time and came away feeling quite dazed with inspiration! He’s a seriously clever chap. Oh Janna, how do you do it? You have a knack of finding the perfect gardens to visit. This is beautiful. I’ve never been sure about that pink Muhly grass but with the sanguisorba (? ), perfect. I do see some fabulous gardens. I put it down to reading, reading and more reading. Not many gardens get past me! And as you say, when the pink grass is balanced, it’s looks fantastic. Hi Bob. Thanks so much for taking the time to leave a comment. It’s fantastic to hear that the Chanticleer magic really does rub off on everyone, gardener or no gardener! I like your comment about the wonderful sights on both large and small scales. It is true that huge attention is paid to both the micro detail and the macro picture, which requires two very different skill sets. I also love the fact that there are no ‘Do Not…’ signs. It has such a huge impact on the atmosphere of the garden and I’m almost certain results in people treating the place with even more respect. I would so love to be close enough to be able to go and find a quiet spot to enjoy each of the seasons, but despite living so far away, I’m determined to venture back again one day. It sounds like I need to plan it in for a Friday night picnic; how fun that would be. I hope to see you there! Going by this post, chanticleer seems such a beautiful place to me..i am a horticulturist in Kenya and would love to travel over there someday. It is one of the most loved gardens in the world. I do hope you have an opportunity to visit it one day.